By Travis - Brazil - 13 Jul/03 - Viewed 9786 times. We flew from Cusco to Iquitos, Peru (with a short layover in Lima) on July 5. As would be expected in a jungle town only accessible by air and river, it was hot, muggy and pretty dirty. However, an air conditioned room in a very, very nice hotel was included in the river cruise package that Abi�s parents selected. In the late afternoon we explored the market near the riverfront, where we picked up two hammocks that we would need for the second part of our trip down the Rio Amazonas. The following morning the travel agency shuttled us to the boat, a three deck, iron-sided boat about 120 feet long named (aptly enough) the Rio Amazonas. This boat travels between Iquitos and the Triple Frontier of Peru, Columbia and Brazil, and we had seven passengers for the three day downriver trip (us, Abi�s parents and youngest brother, and a couple from Dallas, Texas). The cabins were nice, including a shower and A/C, and the food was quite tasty, with opportunity for seconds at every meal (we both gained back a couple of the pounds we had shed in the Andes). During the three day trip, we made several excursions from the boat. First we visited a family-owned sugarcane farm where they made rum and molasses. Later we stopped in a couple of villages to see traditional dancing, buy some crafts, and visit a primary school. Two of the mornings began with a bird watching expedition in a small boat, one afternoon we went fishing for pirannah (we had no luck, but I caught a small catfish), and one night we scouted for caiman, similar to a crocodile. First, our guide snatched a spot-lighted caiman (about two feet long) with his bare hand, then Abi�s brother (Seth) caught another one. 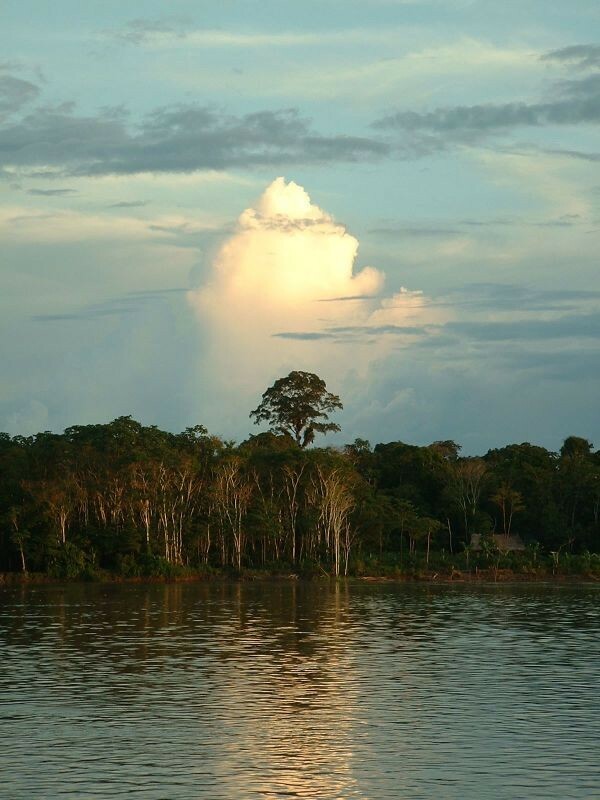 We we arrived at the Triple Frontier, Abi and I made our arrangements to travel further down the Amazon to Manaus, Brazil (her family took the return trip to Iquitos, and would return to the USA a couple days later). We met up with her family again, and spent what little time we had in Leticia, Columbia riding around on motor-scooters and shopping for souveniers. We boarded the ferry at 1:00 PM, and picked out a nice spot for our hammocks. The main deck of the ferry was approximately 25 feet wide and 100 feet long, and they strung about 100 hammocks for the passengers (many of them very small children). We were on that boat for three and a half days, there was always a breeze, there were no bugs, and it was much cleaner and more comfortable than we had expected. Three meals a day (two meals each day consisting of chicken, rice and pasta) were included in the $60 fare. After three days on the Amazon with Abi�s family, three more on the ferry were a bit monotonous, but it was cheap transportation to Manaus. In all, we sailed 1900 KM on the Amazon from Iquitos to Manaus. Arriving in Manaus late on Saturday afternoon, nearly everything in the older area of town was closed and would remain so unitl Monday. We took a cab to a modern shopping area (it was like being at the Galeria back in St. Louis), where we were able to buy our plane tickets to Rio de Janeiro. We had originally planned on doing a jungle trip from Manaus, but with already a week spent on the Amazon and all the side trips we did from the Rio Amazonas boat, we decided to get out of the humidity and onto the beach.